Monopoly is a board game and form of time travel created by Professor Rich "Uncle" Pennybags. The basic theory behind Monopoly's time travel mechanic is that by doing something incredibly boring, tedious, and generally a waste of time for several hours on end, you can actually jump forward several hours through the space-time continuum. This amateur theory has caused modern physicists like Stephen Hawking to cry (or at least type ";-;" into his computer). However, in recent years, after the Monopoly Paradox of '72, the use of Monopoly as a means of time travel has been made illegal. Instead, in its board game form (discussed below) it is commonly used as a form of torture, counterfeiting currency, and splitting families apart. For those without comedic tastes, the so-called experts at Wikipedia think they have an article very remotely related to Monopoly. Rich "Uncle" Pennybags came up with Monopoly after trying to plan out his own suicide, in a time commonly referred to as his "Great Depression". He wanted to leave this life in the dullest, most painful way he could imagine, so he set to work creating the board game in order to bore himself to death--slowly. His idea was that by time-shifting his death over a period of hours or even days, he could accomplish his dual goal of suicide and traveling to the future. Unfortunately, on his first attempts, he forgot to stop eating and drinking while trying his Monopoly experiment. While he made it to the future, he did not die. Rich "Uncle" Pennybags gave up on the idea of Monopoly as a suicide machine, and instead concentrated on making it into a board game. He began with putting together the iconic Monopoly board that we all know today. He started with hexagon- and circle-shaped boards, but ultimately decided those were too fun, and thought that a perfect, unimaginative 10x10 square would much better suit the drab game. After listening to capitalist radio for an unhealthy amount of time, Rich "Uncle" Pennybags decided money was the only way to happiness. He called up his friends, the Mafia, and asked them to print up some counterfeit money for him. Unfortunately, the Mafia was all out of their usual paper, so they improvised and started printing on colored paper. When Rich Uncle Pennybags received the brightly colored money, he was very angry, and began throwing boxes and crates around his apartment like Donkey Kong or something. After calling the Mafia and demanding a refund, they obliged by sending more colored bills to Pennybag's residence. His only choice was to include them with the game he was working on, because that way, he would at least make some money off of the worthless bills. Lastly, Pennybags acquired the iconic pieces when his roommate in college, Dumbledore, helped him shrink down many common things and turn them into silver (or at least pewter). This had several profound effects on history. For example, the titanic was actually shrunk and turned into a Monopoly piece, contrary to popular myth of Glacierism. There was brief lawsuit from PETA involving a missing dog, however, PETA dropped all the charges when they discovered he was simply turned into pewter. Since the dog wasn't being skinned and having its fur turned into a coat, it didn't count as animal abuse. 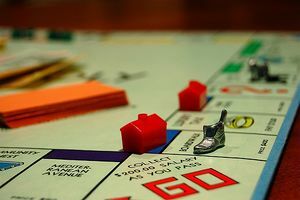 The "Great Recession" tanked even Monopoly's most prestigious property. 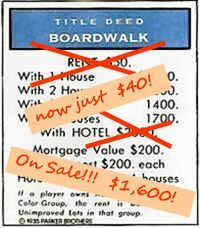 Populist rage against the "one-percenters" has even infected the game of Monopoly, with players squatting en mass on Boardwalk until they obtain a major redistribution of wealth. Recent years have not been kind to Rich "Uncle" Pennybags or the game of Monopoly. When the Real-Estate Bubble burst in 2007-2008, property values across the world plummeted, and Monopoly properties were no exception. Pennybags found himself bankrupt overnight. 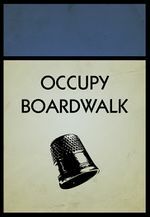 Indeed, the public outcry resulting from the resulting "Great Recession" was so great that a mass popular movement known as "Occupy Boardwalk" has taken root, and threatens to tear the Western world's capitalist foundation to its core.